Today the Virtual Potluck team is celebrating the release of fellow team member Donna Currie's new cookbook. We're all making a recipe from her book and sharing them with all of you! 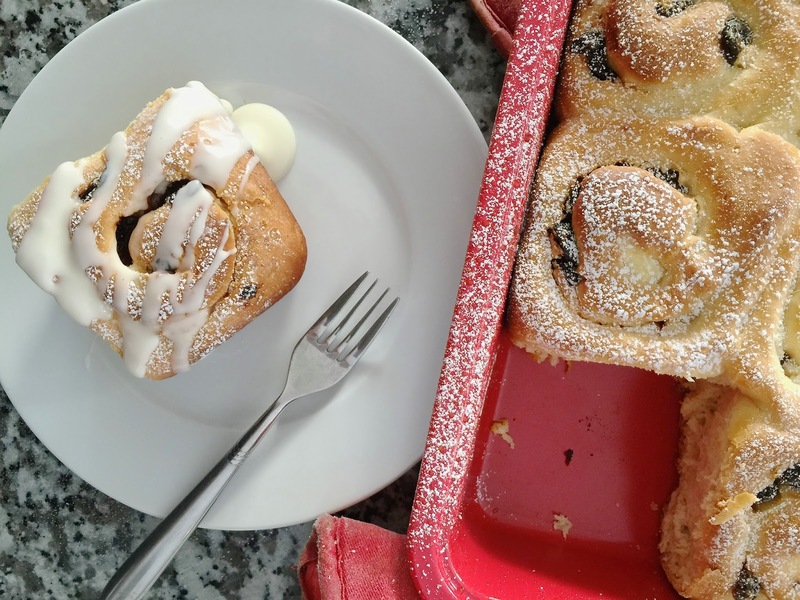 As I went through the book there were so many recipes that I wanted to try right away but the one that stuck out the most was the Blueberry and Cream Cheese Buns with Lemon Zest. I was originally going to make it with blueberries as the recipe called for but one of Donna's notes on the recipe suggested that you could use dried cherries and I remembered my wife had just bought some tart dried cherries that I thought would be an awesome addition, so I switched it up a bit. I still want to try it with blueberries but I loved them with the cherries too. I've made hundreds of cinnamon rolls but I've never used cream cheese as the filling. 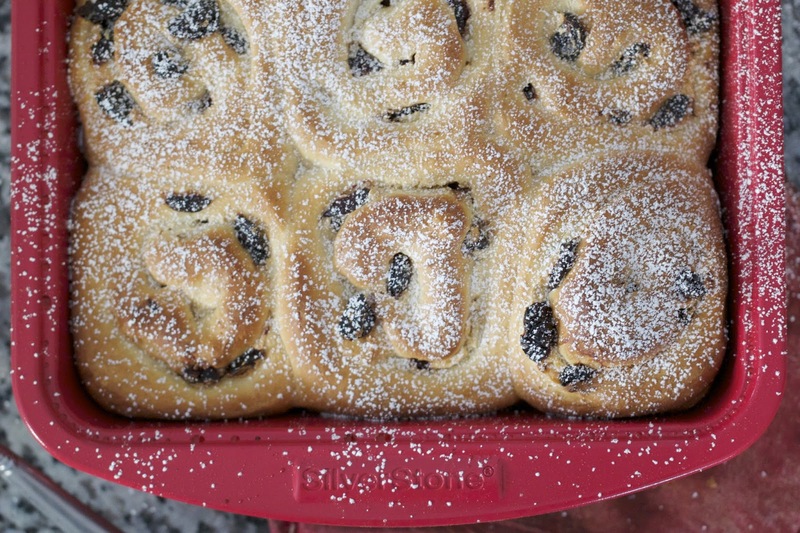 I loved how it kind of melted into the bread dough as it baked but the tangy flavor still remained and was perfect with the tart cherries sprinkled throughout the dough. The only change I made to the recipe was doubling the amount of dried fruit in the filling. There are so many great breads throughout the book and the best part is that each recipe can be broken out over multiple days so don't have to spend your whole day baking. She also has plenty of tips and tricks to help the beginning or even the advanced bakers learn a few things. A Virtual Potluck isn't complete without giving some things away and Donna has rounded up some great sponsors and prizes! There are multiple winners so check it out below! Check out all the other posts as well for some great recipes! 1) Combine all of the dough ingredients and knead by hand (mix first in a large bowl, then turn out and knead) or in a stand mixer fitted with the dough hook, until the dough is elastic. 2) Cover the bowl with plastic wrap and let the dough rise until it has doubled in size, about 1 hour in a warm room. 3) Meanwhile, make the filling: Take the cream cheese out of the refrigerator and let it come to room temperature. When the cheese has softened, place it in a small bowl with the sugar, lemon zest, and 1 tablespoon milk. Mix well. You need a spreadable consistency, but it shouldn't be runny. Add more milk, if necessary. 4) Spay a 9x13x2-inch baking pan with baking spray. 5) When the dough has risen, flour your work surface and turn out the dough. Pat it into a rough square shape, then use a rolling pin to roll it to about 12x16 inches. Spread the cream cheese mixture on the dough in as even a layer as possible. It's easiest to dollop the mixture on, then spread it in that area rather than trying to spread it all from one large blob. An offset spatula works great for spreading. Leave about an inch of the dough uncovered on one of the long ends. 6) Sprinkle the cherries evenly on top of the cream cheese. 7) Roll the dough, jellyroll style, beginning at the long end opposite the dough you left uncovered. Leave the roll a little bit loose as you go. 8) Cut the roll into 12 even pieces (each about 1 inch thick) and arrange them cut side up i nteh prepared baking pan. 9) Cover the pan with plastic wrap or place the whole pan in a large plastic bag and tie the open end closed. Refrigerate overnight or up to 24 hours. 1) Take the pan out of the refrigerator and heat the oven to 350 degrees. 2) Remove the plastic from the pan and bake the buns until they are golden brown, about 40 minutes. 3) Let the buns cool in the pan for 10 minutes, then transfer them to a rack to cool. 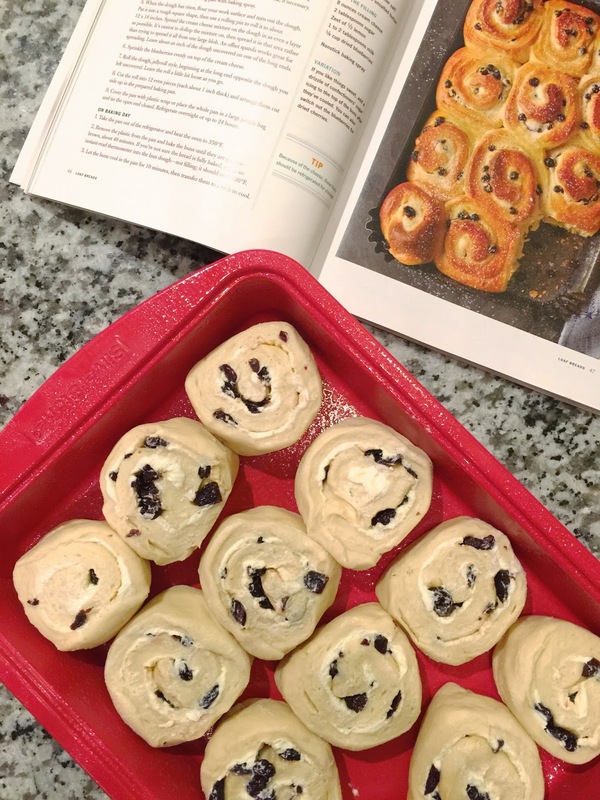 Taunton Press, the publisher of Donna's book, is supplying a total of 12 copies of Make Ahead Bread, one to each winner. The buns look amazing Matt! Bet you kids loved them! 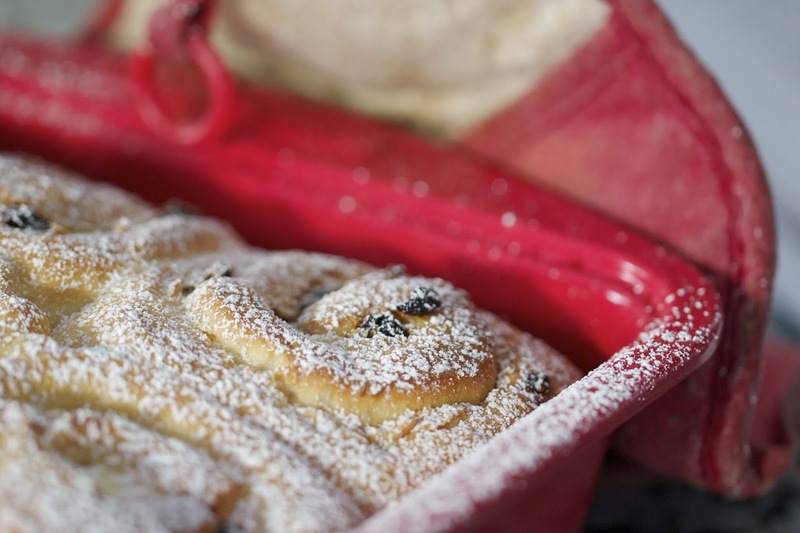 I love that you used cherries in this recipe! Blueberries are good, but cherries are better. 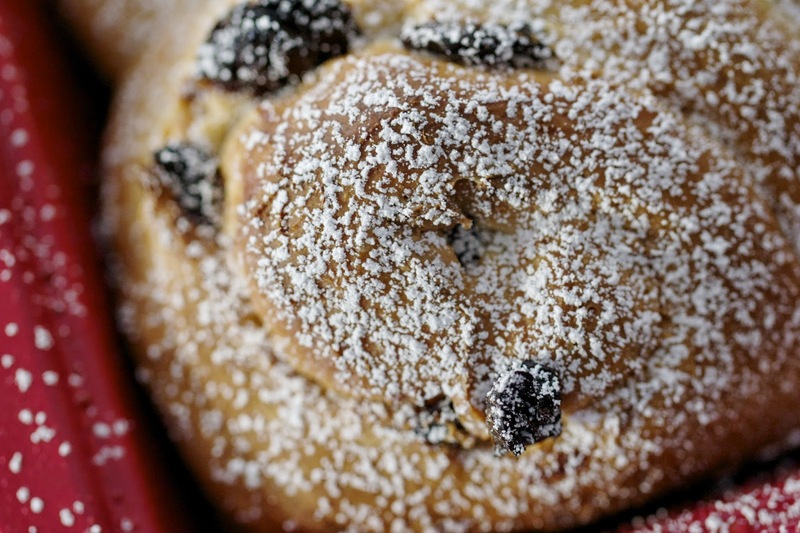 Love the use of tart cherries in these buns! Nice adaptation! Thanks for doing this! My favorite recipe for bread is my mother's orange nut bread recipe. We have it every year for Christmas breakfast.